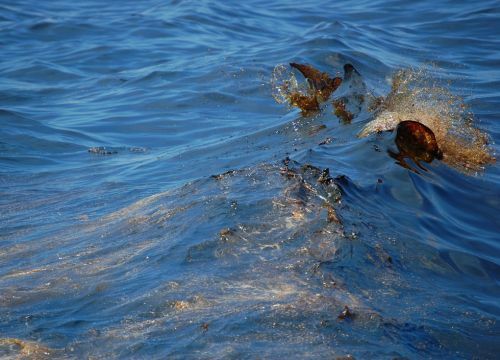 Five Years After Deepwater Horizon, How Is NOAA Preparing for Future Oil Spills? This is the ninth and final story in a series of stories over the past month looking at various topics related to the response, the Natural Resource Damage Assessment science, restoration efforts, and the future of the Gulf of Mexico. APRIL 22, 2015 -- When the Exxon Valdez tanker ran aground in Alaska and spilled nearly 11 million gallons of crude oil in 1989, the world was a very different place. New laws, regulations, and technologies followed that spill, meaning future oil spills—though they undoubtedly would still occur—would do so in a fundamentally different context. This was certainly the case by 2010 when the Deepwater Horizon oil rig suffered an explosion caused by a well blowout in the Gulf of Mexico. Tankers transporting oil have become generally safer since 1989 (thanks in part to now-required double hulls), and in 2010, the new frontier in oil production—along with new risks—was located at a wellhead nearly a mile under the ocean surface. Since that fateful April day in 2010, NOAA has responded to another 400 oil and chemical incidents. Keeping up with emerging technologies and changing energy trends helps us become better prepared for the oil spills of tomorrow, whether they stem from a derailed train carrying particularly flammable oil, a transcontinental pipeline of diluted oil sands, or a cargo ship passing through the Arctic's icy but increasingly accessible waters. So how is NOAA's Office of Response and Restoration preparing for future oil spills? Crude oil production from North Dakota's Bakken region has more than quadrupled [PDF] since 2010, and responders must be prepared for spills involving this lighter oil (note: not all oils are the same). Bakken crude oil is highly flammable and evaporates quickly in the open air. Knowing the chemistry of this oil can help guide decisions about how to respond to spills of Bakken oil. As a result, we've added Bakken as one of the oil types in ADIOS, our software program which models what happens to spilled oil over time. Now, responders can predict how much oil naturally disperses, evaporates, or remains on the water's surface using information customized for Bakken's unique chemistry. We've also been collaborating across the spill response community to boost preparedness for these types of oil spills. Earlier this year, NOAA worked with the National Response Team to teach responders about how to deal with Bakken crude oil spills, with a special emphasis on health and safety. The increase of Bakken crude poses another challenge to the nation: spills from oil-hauling trains. There are few ways to move Bakken crude from wells in North Dakota to refiners and consumers across the country. To keep up with the demand, producers have turned to rail transport as a quick alternative. In 2010, rail moved less than five million tons of crude petroleum. By 2013, that number had jumped to nearly 40 million. NOAA typically responds to marine spills, but our scientific experience also proves useful when oil spills into a navigable river, as can happen when a train derails. To help answer response questions for waterways at risk, we’re adding even more data to our tools for spill responders. Ongoing updates to the Environmental Response Management Application (ERMA), our online mapping tool for environmental response data, illustrate the intersection of railroads and sensitive habitats and species, which might be affected by a spill from a train carrying oil. Oil imports from Canada, where oil sands (also known as tar sands) account for almost all of the country’s oil, have surged. Since 2010 Canadian oil imports have increased more than 40 percent. Oil sands present another set of unique challenges. This variety is a thick, heavy crude oil (bitumen), which has to be diluted with a thinner type of oil to allow it to flow through a pipeline for transport. The resulting product is known as diluted bitumen, or dilbit. Because oil sands are a mixture of products, it’s not completely clear how they react in the environment. When this product is released into water, the oils can separate quickly between lighter and heavier parts. As such, responders might have to worry about both lighter components vaporizing into toxic fumes in the air and heavier oil components potentially sinking down into the water column or bottom sediments, becoming more difficult to clean up. This also means that bottom-dwelling organisms may be more vulnerable to spills of oil sands than other types of oils. As our experts work to assess the impacts from oil sands spills (including the 2010 Enbridge pipeline spill in Michigan), their studies both inform restoration for past spills and help guide response for the next spill. We've been working with the response and restoration community around the country to incorporate these lessons into spill response, including at recent meetings of the West Coast Joint Assessment Team and the International Spill Control Organization. As shrinking summer sea ice opens shipping routes and opportunities for oil and gas production in the Arctic, the risk of an oil spill increases for that region. By 2020, up to 40 million tons per year of oil and gas are expected to travel the Northern Sea route through the Arctic Ocean. Responding to oil spills in the Arctic will not be easy. Weather can be harsh, even in August. Logistical support is limited, and so is baseline science. Yet in the last five years, NOAA's Office of Response and Restoration has made leaps in Arctic preparedness. For example, since 2010, we launched Arctic ERMA, a version of our interactive response data mapping tool customized for the region, and released Arctic Ephemeral Data Guidelines, a series of guidelines for collecting high-priority, time-sensitive data in the Arctic after an oil spill. But we still have plenty of work ahead of us. During a spill, we predict where oil is going, but Arctic conditions change the way oil behaves compared with warmer waters. Cold temperatures make oil more viscous (thick and slow-flowing), and in a spill, oil may be trapped in, on, and under floating sea ice, further complicating predictions of its movement. We've been working to overcome this challenge by improving our models of oil movement and weathering in icy waters and researching response techniques and oil behavior to close gaps in the science. This May, we also find ourselves in a new role as the United States takes chairmanship of the Arctic Council. Amy Merten of NOAA's Office of Response and Restoration will chair the Arctic Council’s Emergency Prevention, Preparedness and Response Working Group, where we hope to continue international efforts to boost Arctic spill preparedness. After decades of dealing with oil spills, we know one thing for certain—we have to be ready for anything. In the last five years, we’ve responded to spills from the mangroves of Bangladesh to the banks of the Ohio River. These spills have involved Bakken crude, oil sands, and hazardous chemicals. They have resulted from well blowouts, leaking pipelines, derailed trains, grounded ships, storms, and more. In fact, one of the largest spills we've responded to since Deepwater Horizon involved 224,000 gallons of molasses released into a Hawaiian harbor. Whatever the situation, it's our job to provide the best available science for decisions. NOAA has more than 25 years of experience responding to oil spills. Over that time, we have continued to fine-tune our scientific understanding to better protect our coasts from this kind of pollution, a commitment that extends to whatever the next challenge may bring. This is a post by Meg Imholt of NOAA's Office of Response and Restoration.